We go hard in the paint! Sports Marketing 101 w Felipe Lopez!! 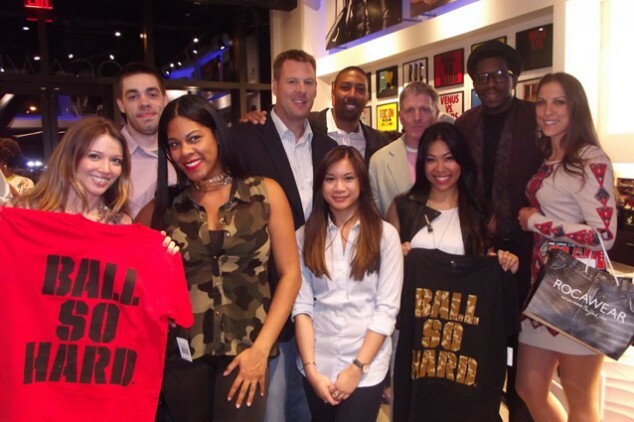 In an intimate setting within the Rocawear Store in Brooklyn’s own Barclays Center, CEOs and former NBA players spoke about the art of marketing in the sports industry. As Notorious B.I.G.’s hits filled the atmosphere with a rugged, classy touch, the featured panelists keyed in on their experiences and everyone in attendance got a taste of what it’s like to navigate the highly competitive world of sports marketing. Felipe Lopez, who had stints with the Minnesota Timberwolves, Vancouver Grizzlies and Washington Wizards, spoke about his journey to forge meaningful relationships in business and life through the Felipe Lopez Foundation. Through his foundation, Lopez hopes to inspire people to get more involved in their communities and help to inspire children to become whatever they dream to be. In his home country, the Dominican Republic, Lopez has helped inner-city youth by coordinating and teaching basketball clinics, talking at speaking engagements about his path to the NBA and demonstrating by example that you build your own future. When Lopez was a star for the St. John’s Red Storm back in the mid ’90s, he remembers that even then relationships were an integral part of his life and success. He stressed the importance of treating people with respect and dignity, regardless of their position on the team. “Relationships are the most important thing we’re able to do,” explained Lopez. When Lopez entered the NBA in 1998 with the Grizzlies, he made it a point to go and introduce himself to the people who made the basketball team run. Whether it was an entry-level PR specialist or someone working the phones to sell season tickets, Lopez ensured they knew he appreciated their important contributions to the overall team effort. Lopez discussed how those relationships have helped him become instrumental in furthering the game of basketball in his homeland and throughout the country. Shortly after his playing career, Lopez was named an NBA Cares Ambassador, joining legends like Dikembe Mutombo and Bob Lanier in the effort to enrich the community. From Sports Branded Media Inc., founder and CEO John Meindl gave attendees his perspective on breaking into the industry and the importance of finding your niche. Meindl said his company focuses on two specific branches of marketing: “traditional sports marketing, and everything sports-related in TV and film.” He likes to mention how surreal it was to go from looking in from the outside, to sitting on discussion panels with guys like NBA and NHL commissioners David Stern and Gary Bettman, a testament to the ends hard work can bring. At the time, Meindl simply found a void in the marketing industry and utilized his expertise to take on the way sports were marketed through the media. As the featured speakers gave aspiring entrepreneurs a behind-the-scenes look at what it takes to make it, the future sports magnates mingled with others in attendance and brought their ideas to the table for dissection and reflection while building connections with others in the industry. This exclusive night of networking and knowledge was put together by Janine Just, an experienced firm that focuses on digital PR, social media and event planning. To ensure Brooklyn was well represented, Janine Just brought countless sponsors from the local community to the Rocawear store, including Diamond Envy, Empanada Mama, Hotel BPM, Brooklyn Gin, Workinsports.com, Brooklyn Cupcake, Drink Hint, Sixpoint Beer, Scented Co, Metropolis Soap, Southern Hospitality and Whimsical Confections.